Rumor has it that we’ve turned a seasonal corner and can expect gradual cooling north of the Equator with commensurate warming to the south. But take rumors like these with a grain of salt, since temps will likely be scorching in temperate zones for at least another month or two. But the advancement of the season does signal shifts in bird behavior, which is, in itself, pretty hot. I was excited to bring my daughter Ivy to see her first Sandhill Cranes, a rare but abiding species for Monroe County, NY. I get the impression I’m going to enjoy each of her lifers as much as my own. Corey enjoyed some more slow-paced-puddle-birding again this weekend and saw a surprise visitor run past the puddle while he was digiscoping from his car in the dune scrub at Rockaway Beach. A female Ring-necked Pheasant made a run from one clump of vegetation to the next, fortunately going right through Corey’s field-of-view. 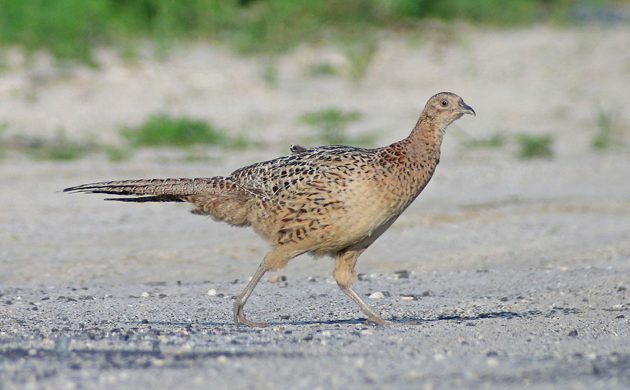 Sure, it’s an introduced species, but seeing a female pheasant so well is a treat! Four wings good two wings better?